are far too many to mention. There is a tool for just about every aspect of carpentry. Everything from your very basic cheap $39 skill saw all the way to expensive Festool equipment that is in the thousands of dollars. There are differences between cheap drills and high-end expensive drills. I have on drills that had a built-in life expectancy. They were cheaply made and did not last long. You only get what you pay for even when it comes to a drill. You can buy cheap Black & Decker drill for $39 and it’ll last about $39 worth of time. Not only are they close you are to use but there also built cheaper. For example something as simple as the chuck which holds the drill bit or the driver. On the cheap drills, it’s even difficult to tighten up the Chuck to hold the bit. The electrical cords power unit is also a cheap plastic which does not flex and bend easily which makes the drill little bit more difficult to handle. The cordless drills similarly art as ergonomically designed when it comes to expense. If you’re out to buy a good cordless drill you can expect to pay at least $100 for a relatively decent one such as a Mikita or Bosch. But if you are using this regularly and depend on it you’re probably looking closer to dollars. What can you say about a drill? It makes holes and drives screws. Whether cordless or corded, they all perform in the same basic way. Since everyone should at least be passingly familiar with what a drill does, I’ll focus instead on different styles of bits. First up is the standard twist drill. This is the most common style of bit for general purpose drilling. They work okay in wood but because of the shape of the tip, can leave a slightly ragged hole. If you’re drilling pilot holes for screws and the like, this is fine, but if you want smooth sided, clean holes for dowels or plugs, then you will want to step up to brad point bits. For just your regular general putting holes in the wood, this is the drill bit you should use. This is great for making holes for bolts, pilot holes. The brad point, or spur bit, is designed specifically for drilling wood. It has a sharp point at its center which helps with accuracy and also keeps the bit from wandering when starting the hole. The spurs to either side act to slice the wood grain before pulling it out, keeping the hole much smoother and cleaner. This is the drill that I use for accurate positioning and creating fine holes in expensive woods. Auger bits are similar to spur bits but with smoother sides and center screw tip. This screw makes the bit pull itself into the wood which helps with the deep straight holes they are designed to drill. They are available in really long sizes so if you need to drill a five-foot deep hole, an auger bit is for you. Try to ease in on the power when starting one because they can really get away from you if you aren’t ready for it. These hole drilling attachments are little more specialized and may require a little more skill than just an ordinary drill bits in a 3/8 drill. For drilling holes over 1/2″, most people turn to paddle bits and Forstner bits. Paddle or spade bits are the berserkers of the drill bit world. Their flat shape makes them flail wildly into the wood leaving raged destruction in their wake. If you need big holes fast in places you won’t see, these are the bits for you. And while all drill bits have issues with a blow out on the exit side of the hole, these are exceptionally bad. To help remedy that, clamp a scrap piece of wood to the exit side. And if you need to enlarge an existing hole using one, first drill through a scrap with the larger bit, then clamp it over the existing hole and let it act as a guide. Forstner bits look completely different from the rest and come in diameters from 1/4″ to 4″. They cut clean sided, flat-bottomed holes. Because of their design, they can also drill overlapping holes which makes them great for wasting mortises or situations where you have to bore out a larger area. While the smaller sizes perform pretty well in a hand drill, the larger ones require a lot of power to turn so should be used in a drill press. Trust that you do not want to try to drive a 4″ bit by hand. If a hand drill is the only option and you need a large diameter hole, switch to a hole saw. Hole saws are great when it comes to making large diameter holes. Since they only cut the outer edge of the hole instead of cutting all of the waste away, they require less power but because they leave the center intact, they are best for through holes. Circular saws again can be purchased at a very cheap price and again your to get what you pay for. The handgrip falls apart on cheap saws the bearing goes on the cheap saws Arbor and they don’t cut straight. A good quality saw should feel good balanced and comfortable in your hand. Try to get a saw that you can return if it does not feel comfortable and safe for your needs. If the sod does feel good in your hand the next major thing is the blade in circulars saw. There nothing worse than a dull blade. The saw should have some indicator marks on it as you need to be able to do accurate cuts giving the ability to be able to cut straight and on dimension. Saw should have easily adjustable that stop so you can adjust the depth to just the right depth to help the saw from binding. Power saws for woodwork break into three basic varieties: circular, reciprocating, and band (I’ll leave chainsaws to someone else). Since bandsaws for woodworking are primarily stationary tools, I’ll cover them later. This time, I’ll focus on the other two. The circular saw is probably the most common saw that everyone has. It is the most simple one to use and is he just want to figure out. Everyone has made a YouTube movie on using a circular saw and would be easy to pick up a few tricks there. Circular saws have a round blade that spins inside a housing and are mostly used for straight line cutting. They can be used freehand for rough cutting but for important cuts that need to be straight, it’s best to run it against a straight edge. A piece of straight lumber will work but I prefer the factory edge of a piece of plywood. There are also purpose-built aluminum tracks available that do the same thing. Jigsaws are probably the easiest saw to handle with the least amount of danger. It gives you time to adjust and correct. It’s a little slower but a little easier to manage if you are not too confident with the higher speed and power tools such as the circular saw the table saw. Jigsaws are probably the most simple thing to cut with the cut slowly and relatively accurately if you have a steady hand and a good eye. You can continuously correct your cut as you go. If you are worried about using this tool you can always cut a little bit proud and then just sand down the leftover extra wood. Jigsaws have a reciprocating blade that travels up and down through the wood. Because the body of the blade is narrow, they can be used for cutting curves and shapes. The narrow blade also means that cutting straight lines can be a challenge. This is especially true in a thick wood where it’s common for the blade to deflect and wander below the surface leaving the cut with angled faces. The key to getting a jigsaw to behave is to use fresh blades, take your time and let the tool do the cutting. Don’t force it. Runners are not a common power tool found around the home. They are meant for more sophisticated trim work and shaping of wood. It is more of a finish carpentry tool than a home repair type power tools. Routers are a specialized item for woodworking that comes in many different sizes and shapes and qualities. They are for creating contours and shapes on wood or you can cut grooves for making slots and wood or even plastic. I find cheaper routers burn out quickly because of the inferior hardware they put inside the such as bearings or bushings. These runners spin at such high speeds requires very good hardware to keep them together and running safely. It’s hard to imagine a tool as versatile as the router. With its endless selection of bit shapes and styles and its equally vast set of jigs, there is little that can’t be done with one. There are bits for cutting joints, making edge profiles, following patterns, and incising designs. Basically, a high speed (8000 – 28000 rpm) motor with a chuck for mounting bits and a sole to control the depth of cut, the router is a fairly simple device. But because of that simplicity, it is easy to manipulate and trick into doing your bidding. Of the three I own, the one that sees the most use is the trim router. Its small size makes it easy to set up and maneuver but it has plenty of power to do what I need. Also, the biscuit jointer is another power tool that is not regularly used in the home, it is normally used for aligning and keeping wood straight before it is glued and giving the joint a little extra strength. This homeowner might use to strengthen joints on particular items around the home. Biscuit Joiner and the Domino jointer that Festool makes approximately do the same thing they are both for aligning wood with the Festool adds an additional bonus of giving the wood joint strength dynamically. The tool is expensive but very precise. It does require a certain amount of skill and know-how to make sure that both the hole and the aligning hole are in the correct position making joints aligned correctly. This could present a learning curve but well worth it if you’re looking for precise accurate joints in your wood. There are also dowel that you might do which is a little bit easier to make they also do excellent alignment for mating surfaces but don’t give as much strength to the connection as would the Domino woodchips that are used with the Festool. Biscuit or plate joining is a type of loose tenon joinery. Where a standard mortise and tenon joint is composed of two pieces, one with the mortise (female side) and one with the tenon (male side), a loose tenon joint has two mortises and a floating or loose tenon that they share. The biscuit joiner uses a small saw blade to cut a semicircular slot that fits one half of a football shaped piece of compressed wood called, you guessed it, a biscuit. When the glue is applied to the biscuit it swells slightly, helping lock everything together. This makes for a clean, fastener-free, and surprisingly strong joint. Because of this swelling action, you have to work fast. If you move too slow the biscuit can swell so much that the joint will no longer close. Breaking complex pieces into subassemblies can help. Also be sure to dry fit everything together before gluing. You don’t want to discover the one misaligned biscuit when your racing the glue. There are all kinds of different Sanders from stationary sanders standing on the floor to palm sanders which you easily hold in your hand and then there’s a whole pile standard’s in between. 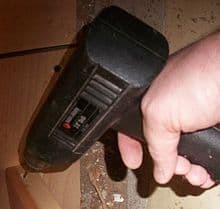 If you want to remove a ton of paint or remove a lot of course and damaged wood then sometimes you might use a belt sander which comes in different sizes from 2 1/2 inch to 4 inches wide. The experienced carpenter that uses sanders a lot knows exactly which type of abrasive sandpaper to use for different types of conditions. This is where the skill comes to shine when the project is sanded correctly and quickly with the right grit all sanding paper. If is trying to remove a certain amount of material with the sander he might start off with a very coarse grit to remove a lot of material quickly but then as he is getting closer to the proper dimension then he has to start using finer grit papers to eliminate scratches. So if the carpenter is using a 36 grit paper to remove a lot of material but he wants to end up with a smooth wood at the end you have to progressively go up numerically in the sandpaper sword next he would have to use a 60 grit paper and then a 80 grit paper than 120 good paper so that each paper will sand out the previous sanding scratches. Palm Sanders are very handy for various things such as removing paint off of wood or steel. Also is great for smoothing out rough wood preparing it for painting and varnishing. Just by changing the sandpaper grit you can go from a rough paper to a smooth fine sandpaper Nothing says drudgery to me like sanding. Hand sanding in particular. Hours of arm stress and mind-numbing repetition. Power sanders help a lot. Broken into three groups, circular (and random orbit), orbital (vibrating) and belt. Each has its strong and weak points. Belt sanders are nice in that they can remove a lot of stock quickly and inexperienced hands can be used for finish sanding. On the other hand, because the belt travels in one direction, it should only be used in the direction of the grain. This makes sanding assemblies difficult. It’s also important to keep them moving to avoid sanding a ditch into the surface. Orbital sanders move the sandpaper in tiny circles. So tiny that it feels like it’s just vibrating. This makes stock removal much slower but also leaves a finer surface. They can be used in any direction if moved slowly, but still perform best when moved with the grain. Available in quarter sheet (palm) and half sheet sizes they are great for final smoothing but still leave tiny little circular scratches on the surface. Originally from : http://makezine.com/2011/02/22/skill-set-what-basic-power-tools-do-i-need/ Check back on Mississauga handyman later for the second part of the Carpentry Series to learn about more tools!